Did anyone else have a “bah, humbug” holiday season??? I sure did… and it was BAAAAAAAD! In fact, it was so bad, that I actually canceled our annual family Christmas get-together for the first time in over 25 years! Even though I knew it wouldn’t be the same without having the extended family together in one place for Christmas, the boys were going through an extremely difficult “rough patch” and I just really needed a break… especially after the “kiddie-brawl” we had on Thanksgiving Day! I am DETERMINED that THIS is going to finally be MY year… but, so far, 2016 hasn’t started out much better. Other than being a new year, nothing’s really new… it’s just more of the same! … EIGHT days of waiting for the insurance company to decide whether or not Jimmy actually NEEDED the new medication his doctor prescribed… TWICE! … ONE huge hole in a closet door made by an angry child wielding a large roll of paper (yes, PAPER!!!). Heck, all of that and I didn’t even get a partridge in a pear tree! But, I DID get HALF of a rabbit carcass left right outside my back door (an obvious a trophy… courtesy of my golden retriever!). Of course, this is in addition to all of the routine stuff around here that seems to quickly zap whatever energy I can muster on a daily basis… cleaning, cooking, shopping, laundry, arguing over whose week it is to clean the litter box and why homework needs to be done right AFTER school and NOT at bedtime, and the struggle of trying to squeeze in the time to concentrate on getting my semi-new business off the ground. Oh…. and, let’s not forget about the never-ending “perks” of having a set of 12-year-old twin boys who are obviously going through some not-so-pleasant changes! At this point, with all of their constant bickering, primping, arguing, and emotional outbursts… I can honestly say they are worse than raising GIRLS! To top it all off… I once again made a resolution to quit the nasty and costly habit of smoking… especially since my insurance company is making it very hard for me NOT to try. Not only would eliminating this habit put a crap-ton of money back into our checking account, but our weekly insurance premiums will be cut in HALF… just by going through the smoking cessation program. It sure seems like a WIN/WIN situation! They even assigned a cessation “coach” who will call me every few weeks to see how the “plan” is working and to help me develop some alternative “stress reliever” techniques. Alternative stress reliever techniques… Hahahahaha! I can’t wait to see what she comes up with. Gum??? Exercise??? Meditation??? Busy work??? If I’m really lucky, maybe she’ll suggest medication… or a much-needed vacation… or even drinking!!! Then again, I’d probably forget to put that in my shopping cart, too! This entry was posted in Mommy Monday on January 25, 2016 by Lynn. Almost every mom I know has “cursed” their child/ren at one time or another… I mean, how could they NOT?!? Kids can be soooooooooo frustrating sometimes. Especially the pre-pubescent ones! I have one of those… well, actually two… but this one particular 12-year-old of mine seems to thrive on creating chaos wherever he goes… at school… on the bus… family outings… shopping trips… appointments… cookouts…. birthday parties… and especially at HOME! He will argue about anything… he will nag you about everything… and he will not stop until he gets his point across LOUD AND CLEAR! He’s always right – I’m always wrong… his punishments are never fair… and, even though I’ve raised 5 children before him, he knows waaaaaaaaaaaaaaaaay more about parenting than I could ever hope to! …which of course begins the cycle all over again. …and, unfortunately, a very real part of “growing up”. Anyone who has ever raised a headstrong child knows how horrendous the tween years can be. And anyone who knows ME, knows that I was a FIRM believer in that “curse”… at one time anyway. Raising my first child… Charlie… was VERY similar to raising this little “mini-Charlie”. He was also a very headstrong, anti-authority, know-it-all type of child. We went to war on many occasions during his tween years (and beyond! )… and, like many mothers with challenging children, I “cursed” him… A LOT. Fortunately, he eventually grew up and grew out of that phase. In fact, when he wasn’t fighting his demons, he was actually a LOT of fun to hang out with. I remember the day he called to tell me that he was going to be a dad… I was thrilled! Not just at the prospect of having another grandchild… but at the prospect of HIM finally being on the “receiving” end! And when he told me it was TWINS, I was ECSTATIC! All I could do was laugh… and lovingly tell him that nobody deserved it more than he did! He just chuckled and said, “Yeah… I thought you’d get a kick out of this… that’s why I called you first”. Since then, that “curse” has come back to haunt me MANY times over! Recently, after a particularly trying weekend with Jimmy, I threw caution to the wind and I “cursed” him. Apparently he has heard me offer my so-called “words of wisdom” to other moms on more than one occasion because he immediately felt the need to remind me (in his own words, of course!) of the possible “consequences” to “cursing” him. By the time HE has children of his own, I’ll be too darn old to raise them! This entry was posted in Mommy Monday on September 28, 2015 by Lynn. Whew!!! What an incredibly BUSY few months it’s been! The “event of the year” (a/k/a Jared & Kay’s wedding) was a total success! Everything was beautiful… food was plentiful… and everyone looked absolutely stunning in their grown-up “fancy” clothes (as the boys like to call them 😉 )! Not only have we added another beautiful daughter to our nest, but the best part was that she didn’t have to walk down the aisle in sweatpants or jeans! That’s right… I actually pulled it off… the wedding dress and all the other little tasks were completed AND I even had a couple of days to spare… which, of course, I spent frantically running to a dozen stores trying to find something for the rest of us to wear. I’m so relieved that I no longer have to “dwell” in the basement where my sewing machine resides, my family no longer has to eat out of a bag or a box, and our home no longer looks like the aftermath of a tornado (though it’s now canning season, so it still looks like a strong windstorm has been hovering over us!). For three entire months, everything… and I mean E V E R Y T H I N G… has been put on hold. The only reason my house looked clean and clutter-free for a day or so last month was because my parents came in from out of state for our annual family reunion… and… well… let’s just say I had a really good reason for banning my mom from the basement! As crazy as it’s been around here, I really love it when my parents visit… phone calls are always nice, but there just nothing a good old-fashioned hug from your mom! It’s like the next best thing to mommy “kissing it and making it all better”!!! Like the laundry room… and the family room… and the guest bathroom… and the BARN! Just because I haven’t had a spare moment to work on any projects does NOT mean that I haven’t been stockpiling inventory (though I’ve been really careful about doing any more “shopping” under the influence of medication!). I’m such a sucker for garage sales, curb finds, auctions, and thrift shopping that some might think I need a support group… but, what I REALLY need is uninterrupted TIME to unleash some of this pent-up creativity! I swear… every time I open the door to our barn and turn on the lights, I keep expecting to hear an “announcer guy” saying…. “…and on our NEXT episode of Hoarders…” sheesh! Thankfully, I have a plan for each and every piece of furniture out there… I just need a chance to channel it from my head to my hands… It sounds so simple, but when you have two needy pre-teens… it’s extremely DIFFICULT! For the past few weeks, I’ve been spending all of my time trying to play “catch-up”, although I’m not really sure I understand the object of that game very well, because I NEVER win! If my family agrees to suspend the remaining 2015 birthdays until 2016, have Thanksgiving dinner in March, and celebrate Christmas in July, then I REALLY think this is totally do-able! This entry was posted in Mommy Monday on September 21, 2015 by Lynn. Remember when the recipe for JELL-O Jigglers came out? It was such a “fun” twist to an old favorite! Kids thought it was great that they could eat JELL-O with their hands, and all of the “cool” parents jumped on the bandwagon to make these fun treats for their kids in all different flavors and shapes. You know… the “oh crap! stuff”. I was never much on providing a lot of sugary junk food for my kids… I opted for fresh fruits and vegetables instead- and they were surprisingly okay with that. In fact, fresh veggies with dip was one of their favorite after-school snacks! I could never seem to keep enough of it in the house. I remember being at the grocery store right around the time when JELL-O Jigglers were first introduced. They were offering free Jiggler molds with the purchase of 2 boxes of JELL-O… so I bought a couple of boxes and went home with my strawberry JELL-O and my “cool mom” Jiggler mold. A few nights later, my husband and I left the kids with a babysitter. On those occasions, I would always try to have a special treat for them (okay… so maybe it was a “bribe” 😉 )… IF they were good for the babysitter. With 5 kids always going in 5 different directions, babysitters were VERY hard for us to keep- I had to do whatever it took to keep them coming back! So, I made those fun JELL-O Jigglers… ONCE! After my husband and I had returned home, I remember walking through the living room, past the dining room, and into the kitchen for something to drink. When I opened the refrigerator, I noticed that the whole plate of JELL-O Jigglers was gone. To me that could only mean ONE thing… the kids behaved for the babysitter!!! WHAT… IN… THE… WORLD… HAPPENED?!? The light was on… but all I could see were… SPOTS! Not those tiny little spots that eventually disappear when your eyes adjust to the light… these were huge RED SPOTS!!! My walls and my once white ceiling were now “decorated” with more than a dozen random red blotches! YEP… leave it to MY kids to discover that not only was it fun to eat those JELL-O Jigglers with your hands, but apparently it was a riot to launch them through the air and watch them stick to the ceiling, too! To this day, I’m not exactly sure WHAT the babysitter was doing at the time all this fun was going on, and I’m still not sure WHO the “ringleader” was… but I have a pretty good idea. This has to be one of my kids’ all-time favorite childhood “heartprints” because they still talk about it and laugh about it whenever they get together. I haven’t made JELL-O Jugglers since then, but maybe it’s time to be a “cool grandma” and try those “fun” treats just one more time- I mean, they come in sooooooooooo many more colors and flavors now! This entry was posted in Mommy Monday and tagged grandkids, heartprints, Jell-O, Jello, Jigglers, kids on July 20, 2015 by Lynn. I cannot even begin to tell you how utterly grossed out and FREAKED OUT I am right now! Since we were traveling on a side road with virtually no traffic, I QUICKLY brought my car to a complete stop, flung my driver’s side door open, and swoooooooooooshed a spider OFF MY ARM! Whew! I HATE spiders- the ONLY time I will squash one is when there isn’t anyone else around to do it for me! I’ll admit- this wasn’t a big hairy spider… in fact it was actually kind of small, like maybe the size of a pencil eraser. But it was orange-ish… and ugly… and a SPIDER! Anyway- we continued on down the road (with one LESS passenger!) to run an errand. Afterwards, we went home, let the animals out, got the boys to bed, and then I sat down to unwind and relax a little bit. Finally satisfied that I was just still a little jumpy from that totally ICKY thing crawling on my body earlier, I went back to doing what I was doing. A few hours later (time sure does fly when it’s quiet around here! ), I decided it was time to go to bed. I grabbed my PJs off the bed and headed to the bathroom to change so that I could turn on a light without waking my husband up. I took off my shirt, removed my bra and… OMG!! !… that same #$(%(# spider that I thought I tossed out at the curb hours ago was crawling around on my bra! That “thing” had been next to my skin for 3 hours, and I never even felt it!!! Honestly, if my husband wasn’t already sleeping, I would’ve screamed like a girl… loud and PROUD! Instead, I flung my bra into the bathroom sink, shook the spider off, and turned on the faucet full blast for a couple of minutes. After I calmed down somewhat, I finished getting dressed and went back to the sink to brush my teeth before heading to bed. And just what do you think I found crawling around in the sink bowl?!? YEP! That icky spider… again!!! How it managed to survive the waterfall from the faucet and all that muck and gunk in the sink drain is beyond me! So, on goes the water again… this time HOT WATER, and for a good FIVE MINUTES! Ewwwwwwwww! And then I stood there… for five more minutes… just to be SURE that it didn’t manage to somehow climb back up the drain again. Whew! Nothing… good riddance little spider! Of course, as I was lying in bed, all I could think about was that stupid spider- where it came from, if it was poisonous, if it had bitten me, if there were MORE! YUK! Then I started thinking that maybe I should’ve taken a picture of it… you know… just in case the emergency room doctors needed to identify the huge hairy spider that bit me and put me in a coma or something! Sometime later this morning, I finally managed to find a 10 minute “window” to grab a shower. I stepped out of the shower, got dressed, made my bed, put some laundry away, and then went back into the bathroom to brush my teeth. Just as I was reaching out to turn on the faucet, guess what I found?!? YEP! That stupid spider was back AGAIN! I grabbed a piece of toilet paper, knocked the spider off the faucet and ran out to the kitchen to grab my camera (for the ER doctors, of course! )… hoping it wouldn’t “run away” or HIDE before I could get back to the bathroom! 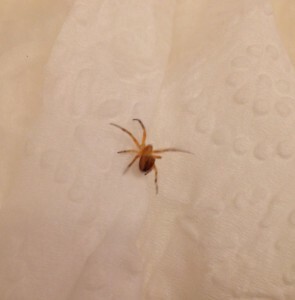 By the time I made it to the sink, the spider was already crawling around on the toilet paper. I carefully lifted up a corner of the paper, flung it into the toilet, and FLUSHED… TWICE!!! I don’t know what kind it was, or where it came from, but I swear… if that thing comes back again, I either have an infestation or it’s a mutant ninja spider! Whichever it is… I can’t seem to get that darned “Itsy Bitsy Spider” song out of my head now… Ugh! This entry was posted in Mommy Monday and tagged big hairy spider, itsy bitsy spider, picture, sink, spider on July 13, 2015 by Lynn. Ok, so I may be just a bit “prejudiced”, but I believe that being a mom is one of THE hardest jobs on earth. I have no doubt that being a dad can be pretty challenging at times, too, but there’s just something about the “maternal bond” that a mother has with her child. It’s not like ANYTHING else I’ve ever experienced… and, good OR bad, I wouldn’t trade it for the world. It doesn’t matter if you birth them, blend them, or adopt them- every mother has a path to travel with her child… lessons to learn… and a story to tell. Well, here it is again… July. July has become a very confusing month for me. On one hand, the month of July brings back a flood of “heartprint” memories. July of 1979 was the final month of my very first pregnancy… the month that my world as I knew it would forever be changed. I was going to be a mommy! I was so excited… and scared to death! It was a huge reality-check when I entered into the “nesting” phase.. the tiny little onesies, sleepers, and cute little boy outfits all washed and neatly folded, bottles washed, diapers and receiving blankets stocked, cradle set up, infant seat in the car, suitcase packed, etc., etc., etc. Ready or not, it was time to be a “grown up”. I was anxious to start this new phase of my life… I just had to wait for you… and wait… and wait! You were supposed to be here on the 19th of June, but that date came and went… and you still weren’t ready. Sheesh! You weren’t even born yet, and you already had a mind of your own! Finally on the very LAST day of June, I started feeling something… regularly… painfully… and for the next 56 hours! I can still remember holding you for the first time, your first tooth (4 months old! ), first word (uh-oh! ), first steps (6-1/2 months old! ), first ice cream cone (9 months), first day of school (4 years- nursery school! ), first Little League game (6 years), and every single one of your other “firsts”… because they were MY firsts, too. You were the first grandchild… the first grandson! You had your grandpa wrapped around your little finger from the moment he laid eyes on you. The baby years started off rough… colic was NOT fun for either of us! Teething wasn’t a pleasant experience either! But potty training?!? You NAILED it! One week and you were completely out of diapers… day AND night! Your terrible two’s lasted until you were nearly four… but once we got past that stage, it was a whole lot easier on both of us! I was constantly amazed at the personality you were developing… it was soooooo big… for such a little boy! The funny, loving, and inquisitive side of you always made my heart melt… the mischievous side of you definitely kept me on my toes! You were fascinated with taking things apart to see how they worked… He-Man was your hero… school was FUN… and your brother was your best friend! You were growing up so fast… and I was still trying to figure out how this whole “parenthood” thing worked. I tried to teach you the things that I hoped would make you a better person… not realizing that you were also teaching me how to be a better parent. and me- not quite sure how much of it I was supposed to let go. I was beside you as you fought your demons going into adulthood. I was always looking for the answers… for both of us… though I wasn’t even really sure what the questions were. I spent countless nights praying that God would keep you safe, re-evaluating my parenting skills, wondering how I could’ve missed the “signs”, and struggling to find a way to “fix” what you thought was so wrong in your life. To this day, I’m still not sure if I was unwilling or just unable to understand the power it had over you. It was probably a little of both. For years, every single day was an emotional roller coaster- fear, shock, disbelief, helplessness, hope, disappointment, frustration, and then… back to fear again. My heart always hoped for the best… even as my head tried to prepare me for the worst- and you knew, deep down, that you were dragging my heart along with you on your journey through hell. I know you knew… because you would always pick up the phone to call me. No matter how bad things got for you, you always made sure to “check in” with a phone call every few days… you knew that I needed to hear your voice just as much as you needed to hear mine. Even when you’d say, “I’m okay, mom”… I knew that you weren’t. You were scared- and I was terrified! It didn’t matter how the conversation went… we always ended our calls with “I love you”… no matter what. I don’t care what anyone says… it doesn’t matter how old you are… it will ALWAYS be MY job to protect you… because I’m the MOM… and that’s what moms are supposed to do! But I was failing… miserably. No matter how hard I tried, I couldn’t seem to protect you from the things that were hurting you… because it didn’t work that way. As badly as I wanted it FOR you… YOU had to want it for yourself. It took me a long time to understand and accept that. People kept telling me that “relapse is a part of recovery”… but it took me a long time to understand and accept that, too. The two of us did a lot of talking, hoping, promising, forgiving, and crying during your periods of sobriety… but, mostly I continued to pray… and hope. And you know what?!? It worked! YOU did it… I was sooooooooo proud of you! For the first time in years you had the sparkle back in your eyes and the laughter back in your soul. After you made the decision to take your life back… one day at a time… you began to move forward. You started working toward repairing and rebuilding the relationships between you and your sons. You knew it would be a slow and challenging process, but at least you were heading in the right direction. You were given another chance at fatherhood when your baby daughter was born. I loved watching you… watching her. You always seemed in “awe” of this tiny little baby. Whenever you held her, there was a smile on your face and a light in your eyes… and you were loving every minute of it! Then, you took the first steps towards rebuilding the many bridges that you had burned along the way… some took more work than others… others were damaged beyond repair. You handled both situations with understanding, maturity, and respect. I can only imagine how humbling that step of the program must have been for you. I finally had my family back together again! I really missed your smile, your laughter, and your wit. We all did. It was so nice to see you happy and making plans for the future. I love that we could talk about anything… and everything… and sometimes nothing at all. You were no longer just my son… you became one of my best friends. So, WHY is July such a confusing month for me?!? Because on the other hand, it brings back a flood of heart-shattering memories. July of 2012 was the final month of your life on this earth… the month that my world as I knew it would forever be changed. This entry was posted in Mommy Monday and tagged adolescent, demons, heartbreaking, heartprint, maternal bond, mom, nesting on July 6, 2015 by Lynn.